For those seeking solid state storage capabilities for their iPod, the iFlash-CF allows you to install and use CF Compact Flash Cards. Simple plug & play installation – iPod works as before just much better ! Using suitable tools, release the holding clips, making your way around the case till it opens. I suggest watching some iPod opening videos on the internet. Before pulling the case apart, release the battery cable – lift the black lock bar -or- gently using even pressure pull up the battery ribbon away from the connector. Rest the front and back side by side, be careful to not cause too much stress on the headphone ribbon. Lift and flip back the hard drive. Gently lift the black bar to release the ribbon from the HDD. Remove all rubber bumpers and strips from the iPods if any remain after the HDD is removed. iPod is ready to accept the iFlash board. 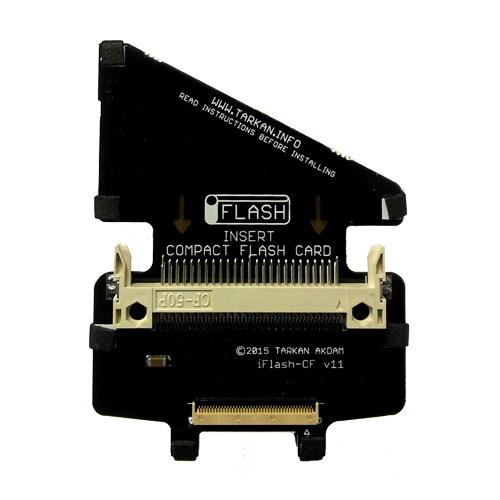 Install CF card on the iFlash-CF, also lift the black bar to accept the ribbon. CF card installed and iPod is ready to be closed. Slide battery cable in to the connector and push down the black latch to lock the ribbon in place. iPod is now ready to restore & sync using iTunes. Note: Manufacturers can and do change the internal circuitry of cards which may effect compatibility, especially of older CF card models.